On a list of daily items you take for granted, milk would be high on most people’s I imagine. When I was younger we didn’t even need to wander down to the supermarket, we just opened the door of a morning and there it was by the front door, the top colour coded for what lay inside. Nowadays I am aware that there are a vast variety of milks out there; soya milk, organic, heat treated, UHT, but for most people it comes down to the old three; Skimmed (why not just drink water), semi-skimmed and full fat (why not just drink cream). Now I have moved out to Moscow to work for a year or two or three, who knows, but on my first trip to the supermarket I picked up a box of cereal and headed down to the milk section. 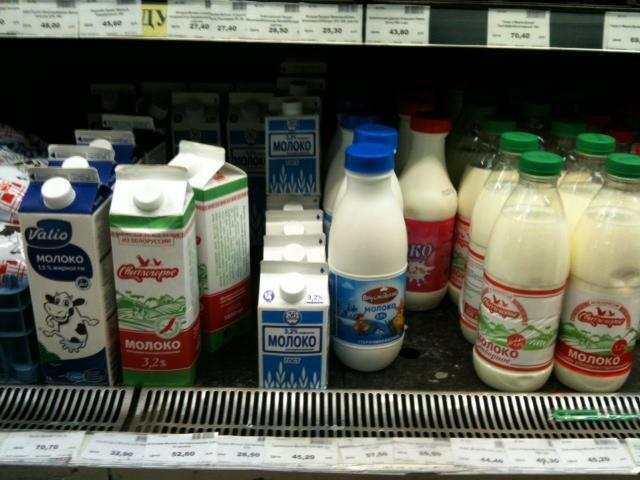 I was aware that milk is called moloko, but what greeted me were a baffling amount of bottles and colours. Red, green, blue, all with different percentages on the front, 1%, 2.5%, 3.2%. Using my logic, I assumed that these would work on a similar basis to home and plumped for a 2.5% carton, but since I didn’t want a litre, I bought a small one instead. It had some other writing on it as well, but it was in the “milk” section, so I purchased it and took it home. The next day I discovered it was closer to yoghurt, not the end of the world, but not what I was hoping for, so down I headed to the supermarket again and bought a plain 2.5% moloko in a plastic bottle. People this is also not semi-skimmed. After that I went down the milk aisle a couple of times and stood holding each bottle, tilting it to check its consistency for a good ten minutes, until the strange looks I was receiving became too much to bear. Now, a week later, I skip (or rather run) past the aisle, or occasionally reach round to grab a yoghurt (a real yoghurt) from the end. Future guests are just going to have to drink their tea black, or have a vodka instead. A small selection of what’s on offer.